Author: Hussain I. Saba, MD, PhD, et al. This course meets the Florida 1-hour requirement in hematology. If you are certified by ASCP, this course provides 12 contact hours in hematology. If you order this course through the website, you may complete it online even if you ordered the shipped version. Hemostasis and Thrombosis: Practical Guidelines in Clinical Management is a hugely important, changing and complex area that impacts many other medical specialties and affects at least 10 million people in the United States alone. It is vital for physicians and other healthcare professionals to recognize abnormalities of hemostasis and thrombosis and be able to address these problems in their patients. This text covers all aspect of the practical management of commonly encountered thrombotic and bleeding disorders, with emphasis on clinical diagnosis, treatment and day-to-day management. 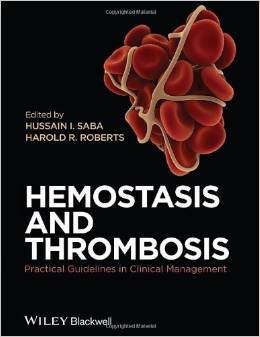 The most clinically relevant material including discussions of new and upcoming diagnostic and therapeutic modalities for thrombotic and bleeding disorders has been included in this text. Although this text is meant primarily for physicians, the topics presented, in particular the biology and physiology, the differential diagnosis and laboratory detection of the conditions addressed, will be of interest as a reference source to clinical laboratory personnel working in the hematology/coagulation laboratory. Although the course is advanced, the material is straight-forward and easy to read.